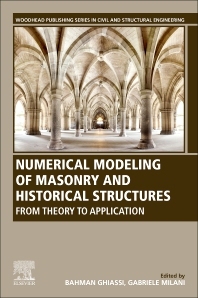 Numerical Modeling of Masonry and Historical Structures: From Theory to Application provides detailed information on the theoretical background and practical guidelines for numerical modeling of unreinforced and reinforced (strengthened) masonry and historical structures. The book consists of four main sections, covering seismic vulnerability analysis of masonry and historical structures, numerical modeling of unreinforced masonry, numerical modeling of FRP-strengthened masonry, and numerical modeling of TRM-strengthened masonry. Each section reflects the theoretical background and current state-of-the art, providing practical guidelines for simulations and the use of input parameters. Bahman Ghiassi is a lecturer (assistant professor) in the faculty of Engineering of the University of Nottingham. He is the author of more than 40 ISI peer-reviewed technical papers. He is on the editorial board of ASCE journal Composites for Construction and International Journal of Masonry Research and Innovation. He also serves as an active reviewer for several international scientific journals and on several international scientific committees (e.g. RILEM TC 250-CSM). Gabriele Milani has been an Associate Professor at the Politecnico di Milano since 2014; previously he was an Assistant Professor (2009-2013), Post -Doctoral Researcher at the Swiss Federal Institute of Technology in Zurich ETHZ (2008) and University of Ferrara (2005-2007). His research focuses on masonry modeling and safety assessment of historic masonry in seismic areas. He works on FEM limit analysis, rubber vulcanization and seismic isolation. He has been awarded with the Telford Premium (2012) award by ICE, the Bathe Award (2014) and the most cited author diploma for a paper in Computers and Structures (2006). He has co-authored more than 120 ISI papers and is the 2nd most highly cited author in Scopus under the keyword “masonry”. He is the EIC of a Journal dedicated to masonry (International Journal of Masonry Research and Innovation) and co-editor of a Scopus journal generalist for civil engineering.